Hi, I am Amy and I am originally from the UK. I've lived in Hong Kong for 6 years now and love showing my guests the hidden gems not everyone gets to see. There are very different local neighbourhoods to explore, sometimes even down just one street. Beaches, hiking, great local food, fabulous shopping - Hong Kong has got it all. During our time together, you can ask me all the questions you are dying to know about and we can explore the most interesting places off the tourist track. Together, we can work out an itinerary that is truly suited to your needs and interests. There is so much more to Hong Kong than the high rise buildings (although they all have an interesting story behind them too!). Come with me on a fun journey and let me share the wonders of this busy city so you will get to know it like I do! 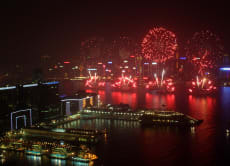 New Year's Eve on Victoria Harbour was one of the top priorities for me when I knew I'd be in town for the festive season, and this was definitely a top choice run by Amy and Jacky. There was a slight delay getting on to the boat, but it was NYE, so it was to be expected, but once on, there was loads of room and a good atmosphere. A fear of running out of beer almost became a reality (I literally grabbed the last one before the first drop-off point after the fireworks)... but the important thing was, everyone had enough drink to see them through. Food was delicious...a little bit more wouldn't have gone astray...but again, it tasted great and everyone seemed happy. The boat captain jostled brilliantly for position, the time spent on board was long enough to get all the enjoyment out of it, and a bubbly toast with a well-thought individual gift to each guest wrapped up the night excellently. 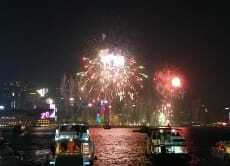 If I'm ever back in Hong Kong for NYE again, I'll definitely take this trip on the harbour again. I had an amazing time with Amy! 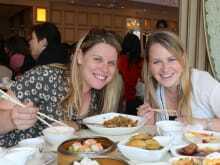 She was really knew the in and outs of Hong Kong and I would have been terribly lost if I didn't have her. 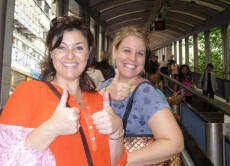 Next time I return to Hong Kong, booking Amy as a guide will be my first step! Had a great time on the cruise, Amy was very helpful and available to answer questions and prepared us well for the event itself. We had a fabulous night! Thank you for an unforgettable experience. The boat, the food, the people were all great. I would highly recommend this experience. Well worth it. I had enjoy my time and had precious experiense with Amy and her family. I had very nice Dim Sum Lunch ! She is very kind and so cute lady. If I visit to Hong Kong, I ask her again!